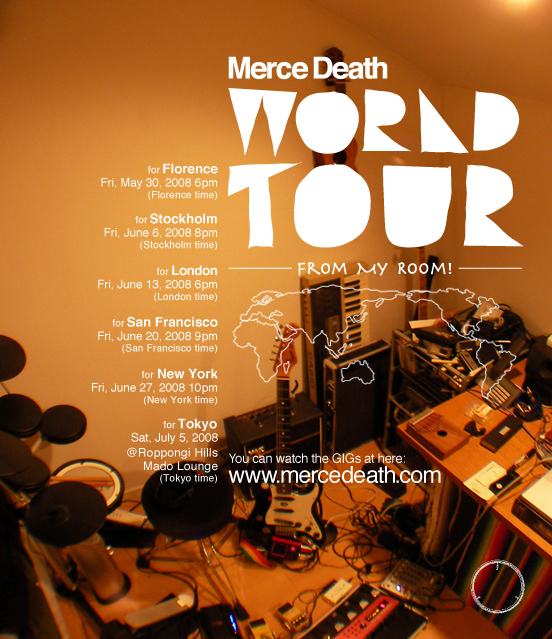 Merce Death is doing some experimental projects. Let's see below! I connected my guitar to the tesla coil it can make lightning with my friend who is mad sientist. When I play a guitar, lightning appear with actual tone I played. The performance is for 10th annyversaly of the Wieden+Kennedy Tokyo it's called "OYKOT" at the Ginza Graphic Garally. The YouTube video for this expriment was picked up by the GIZMODE and the Craclked.com etc, and got over 200,000 view. The site has many Ustream window from different people. We just connect on same timing and Jam. The report of this experiment is on the CBCNET with series. And also I had a GIG with the band on the SuperDeluxe. People joined to the gig from their house or somewhere they were there. CANON is a kind of exprimental movie. I just play once, but put same videos 4 times and bit off the timing with one bar each. Then the sound will have harmony. And that play were improvisation. I expand the idea and it's became Real Time CANON. We use a Max/MSP. When I play, the camera shoot me and the program makes a movie it's a bit off with one bar on real time. I can do the same thing of the YouTube movie on real time. 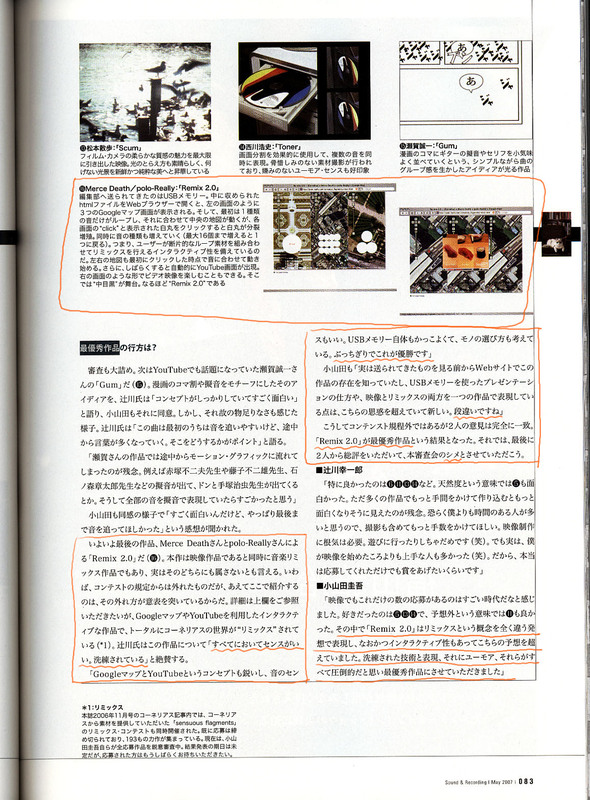 In 2006, there was the "Cornelius music video contest" by Sound and Recording magazine. Our work is beyond their rule, however the judges(Keigo Oyamada, Kouichiro Tsujikawa) loves this work so much and we won. The title was "Re-mix 2.0". But the word "2.0" was spent so much and we change the title.